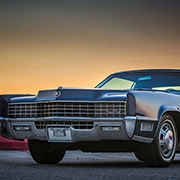 Cadillac Meeting | Geralds 1958 Cadillac Eldorado Seville, 1967 Cadillac Deville,1967 Cadillac Eldorado, 1971 Lincoln Continental Mark III and 1978 Cadillac Eldorado Biarritz. CLASSIC CADILLAC CLUB OF GERMANY - ANNUAL MEETING - 2017 - HUGE IMAGE GALLERY. The German Cadillac Club (CCCD = Classic Cadillac Club Deutschland) held its annual Club Meeting in Bavaria / Germany at the "Starnberger See" in 2017. It was a perfectly organized meeting with about 60 cars of all ages attending. As I am no member of any club, I was allowed to participate as a guest with my 1974 Coupe deVille which performed perfectly. I joined my Cadillac friends from Austria in a convoy to Germany, and we had great fun there. Two driving tours were held on Friday and Saturday through the scenic landscape of Bavaria. Thanks to Christian Doerk for organizing this fantastic event! The whole trip was 503 miles for me, which I enjoyed thoroughly. You can find all the pictures of this event in my gallery here or by clicking on one of the images below.